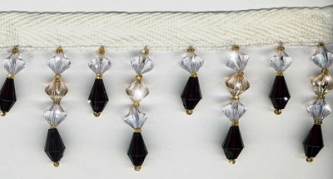 From our California Style Collection: "Beverly Hills " California Style Collection is an exquisite beaded fringe trim in elegant crystal clear beads (that sparkle like diamonds), black beads (that glow like onyx), and rosy beige beads with seed beads in sparkling gold. "Beverly Hills" colors reflect the exciting areas found in Beverly Hills, CA; such as Rodeo Drive! This is a high quality, very full beaded fringe with exceptional detail and craftsmanship. This style tassel fringe is 2 inches long, which includes the 3/8 inch white cloth binding at the top.